PRNewswire: Surround view cameras reach defense industry. 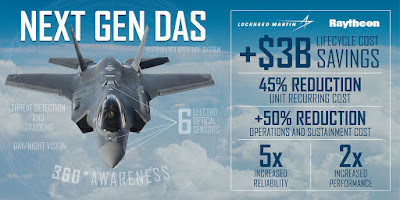 Lockheed Martin selectes Raytheon to develop and deliver the next generation Distributed Aperture System (DAS) for the F-35 fighter jet. The F-35's DAS collects and sends high resolution, real-time imagery to the pilot's helmet from six IR cameras mounted around the aircraft, allowing pilots to see the environment around them – day or night. With the ability to detect and track threats from any angle, the F-35 DAS gives pilots situational awareness of the battlespace.